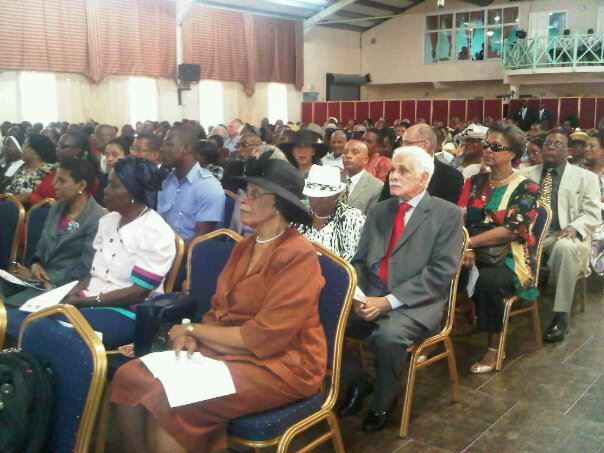 At 10:07 am on Tuesday 07 May 2013, Dr Cecile La Grenade became Grenada’s sixth Governor–General and the first woman to be sworn into that position in a ceremony at the Grenada Trade Centre attended by Government officials, members of the diplomatic Corp as well as her family and friends. 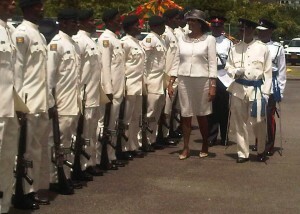 Coloured with the military parade; guard of honour inspection and a 21 gun salute, the ceremony was described as a landmark in Grenada’s history as it is happening in a period where women’s involvement in decision making appears to be ranking high. Following the 19 February General Election more than 30% of parliamentarians became women. Prime Minister Dr Keith Mitchell has described the swearing in of the new Governor–General as setting the tone for National Unity. “For the first time we have someone who cannot be attached to any political party when compared to the last three Governor–Generals,” he told the packed Trade Centre. “Her selection breaks the tradition of being politically attached to become the Head of State,” he adds. “The minute she took the oath and allegiance of office she moved from a fine citizen to the conscience of the nation” he said. Coming from a lineage of family where her grandmother was the first woman to be elected to the legislative council, Dr La Grenade gave the assurance that she will be working in the best interest of Grenada. In her inauguration throne speech, she promised to focus on youth and women. “Any opportunity that can be present to create an impact will be welcome,” she said while pointing out that she believes in the power of education. She also expressed her concerns about the historic buildings and landmarks in the city which were damaged by Hurricanes Ivan and Emily in 2004 and 2005 respectively, and are today in dilapidated conditions. She specifically pointed out York and Government House — two buildings which are directly important to the government of the day. York House housed the Parliament and the High Court, while Government House was the officially residence for the Head of State. Since the Hurricanes, the Grenada Trade Centre became the temporary house of parliament while the Governor–General has resided in rented facilities.